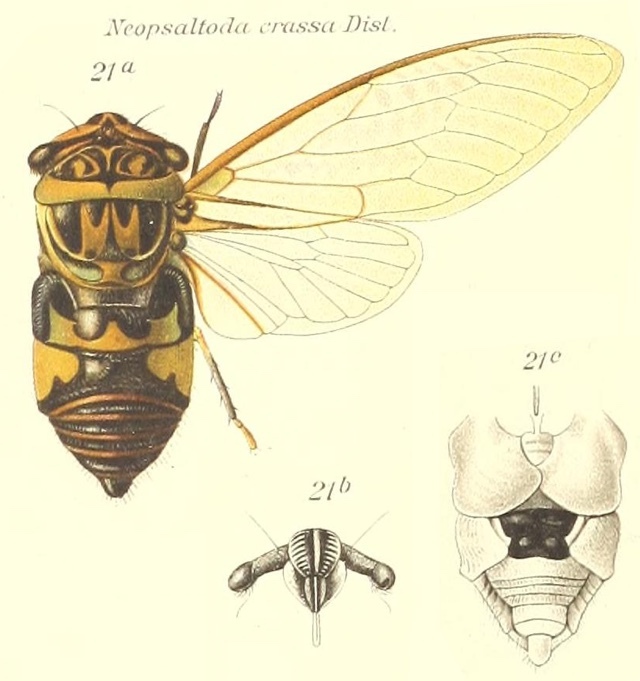 Neopsaltoda crassa Distant, 1910, is a cicada found in Queensland, Australia. Characters. — Head including eyes much broader than base of mesonotum, medial length about half the breadth between eyes, front prominent, at somewhat right angles with the lateral margins of the vertex which are straightly oblique; eyes somewhat large and prominent, extending beyond the anterior angles of the pronotum ; pronotum with the medial length about half as long as breadth at base, the anterior margin arcuate thus narrowing towards lateral margins which are rounded, posterior margin subtruncate; mesonotum including cruciform elevation nearly as long as broad; abdomen short and broad, but longer than greatest breadth, second segment very broad, dilated at lateral margins and lobately continued on each side beneath, the true tympanal coverings entire; opercula somewhat short, broader than long, overlapping internally , their apices broadly rounded; rostrum passing the intermediate coxae; tegmina and wings subhyaline; tegmina about two and a half times as long as greatest breadth, apical areas eight; wings about twice as long as broad, apical areas six; abdomen beneath more or less oblique depressed from near base to apex.